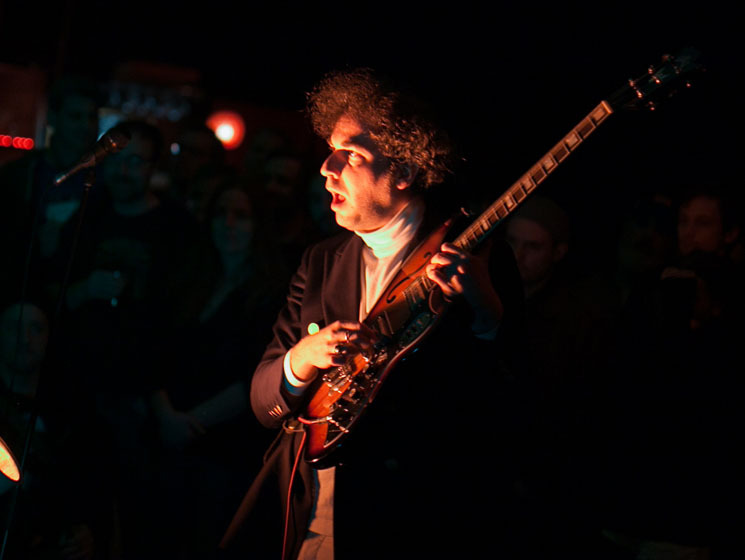 Israeli garage rockers Monotonix may be no more, but guitarist Yonatan Gat continues to be one of the instrument's most boisterous virtuosos with his eponymous improv-based project. Gat, joined by a bassist and drummer, performed on the floor of La Sala Rossa, with the audience in a tight circle around them. Facing each other in intimate confines, the trio delivered a master class in genre-defying improvisation, allowing the audience to see their every move in exquisite detail. Instead of a free-form jam, Gat and crew crafted full "songs" (referred to as such throughout), allowing them to hone in on specific sounds and ideas — a Brazilian psych jam here, some free jazz there — but not draw them out forever. Whenever Gat struck gold on a riff, his collaborators eagerly took notice, modifying their sound instantly to fit the mood. To see the artistic process of song creation first-hand is an experience few musicians can deliver, but this is what Gat does every night. Also remarkable is Gat's capacity for restraint; though his mind is clearly overflowing with riffs, he knew when to put down the guitar and let other aspects of the performance take focus, such as an epic drum solo or a spontaneous dance break, which found the guitarist strutting around the crowd, clearly feeling the music. It wasn't just about merely generating sound but utilizing it to craft an atmosphere, which they most definitely did.